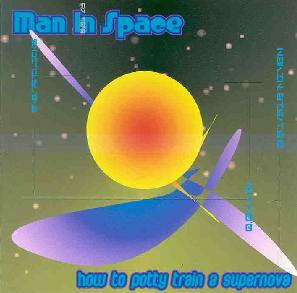 Man In Space - "How To Potty Train A Supernova"
Man In Space is a project headed up by Belgium's own Jan Geerts, who plays all instruments and vocals on the album except for some help on drums and bass on a couple tracks. I first encountered Jan when he made a few of his tracks available for mp3 download and was mightily impressed with what I heard. I'll say from the outset that this CD is high on my list of favorites for 2001. The music's strength comes from a combination of it being not only a killer heavy space rock album, but there are strong progressive rock influences as well with Geerts claiming King Crimson and Van Der Graaf Generator as influences as much as he does Hawkwind. And in addition to this Geerts has a damn good knack for songwriting and melody so he pounds your brain into the cosmos while making you feel really good about the assault. The disc opens with an alien voice announcing, "Attention refugees of planet Earth. Your spacecraft is now boarding. Please follow the purple lines. Follow the purple lines". And then the music blasts out of the starting gate with "Bright Purple Spacecraft". Ooh-wee-ooh synths and a pounding Alan Davey bass make this sound a bit like something off of Captured Rotation or Chaos Delight but the vocals and keyboards allow Geerts to give the song his own identity. This is a killer space rock song and gets my vote for best song of 2001. "Technophobe", "Thanosphere", and "Liberator" are the other powerhouse space rockers in the set and all are guaranteed to light a fire under Hawkwind fans. "You Broke My Heart, So I Smashed Your Tricorder" is an 11 minute improvisation with Geerts on guitar and synths, Kristof Bosmans on electronic drums, and Davy Baeten on bass. The trio jam along laying down trippy looped guitar bits, ripping guitar solos, bubbling space synths, screaming synths, and floating ethereal keyboards. I'd say for an improv it sure sounds composed. And hearing Bosmans on the drums gives a nice rhythmic punch to the music. I'd like to hear more from the full Man In Space trio. But there's also lots of variety on the album. "Die Zeitmachine" is a space rocker with freaky swirling synths, soaring proggy keyboards, and dancey robotic voices. The impressive rolling bass carries the rhythmic pace nicely. "Liaisons Extraterrestres" is an acoustic song embellished by plenty of bubbling synths and passionate Peter Hammill styled vocals. And speaking of Hammill, "Lucifer's Night On The Town" is a dark Van Der Graaf Generator-in-space song. Really... imagine Hammill teaming up with Brock and you'd get something like this. And "One Deep Breath" is a laid-back but heavily sci fi inflected tune. In summary, this is space rock of the highest order. HIGHEST recommendation. I've been blaring this sucker in my car for weeks. For more information you can visit the Man In Space web site at: http://users.pandora.be/maninspace/.